Smart way of living has become the trend nowadays with the increased technology and awareness more and more people are showing interest in turning their homes into smart homes. Smart homes seem to be very much costlier and unaffordable to the normal people since the past few years but with the advent of technology and new age developments smart home isn’t a huge thing nowadays. 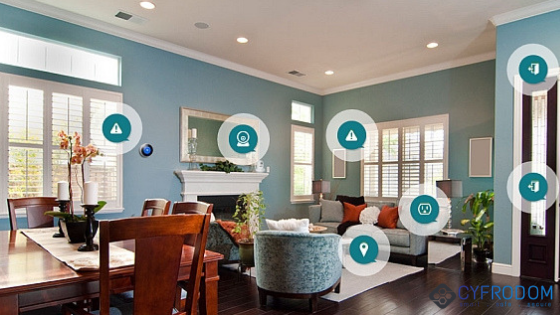 Let us now try to get deep into the details of the smart home interiors. People these days are not just owning homes, they are trying as much as they can to include technology and smartness in their homes to make their lives much more comfortable and easier. Smart homes don’t only make your homes a better place but also make your life much more convenient. A regular locking system for a home used to be considered as the secured way of protecting our home from the dangers prone from outside, but with increased crimes everywhere, we need to be more cautious and it is time to improve our locking systems and security systems at home. Curtains are a certain set of equipment that offers you a private space within your personal space. The curtain controllers from Cyfrodom offers you the ability to operate your curtains within your personal space at the convenience of your fingertips. These hi-tech curtain controllers not only elevate the appearance and interiors of your home but also protect your privacy. Decorate your home in a smart way and make privacy your utmost concern. Motion sensors are applicable for security systems which are used in offices, banks, shopping malls, and also as intruder alarm at home. The existing motion detectors can stop serious accidents by detecting the persons who are closest to the sensor. We can monitor motion detectors in public places. So Cyfrodom’s smart home interiors at affordable prices make your smart home dream a reality.